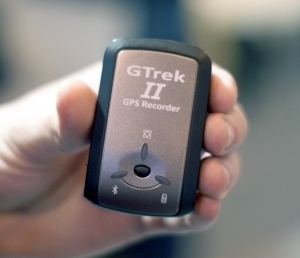 The GTrek II is a small device which allows you to keep track of where you have been. The small device logs data which can be retrieved at a later date by connecting it up to your PC. The device is built small enough to fit in your pocket. It is weather proof (not water proof) which means it can take the occasional tumble and downpour of rain. When you get back to your PC the data is then uploaded and tracking data is overlaid on to mapping programs such as Google Earth (pictured above). You can then take a look over the landscape and see what your journey was like. If you have the device powered on while your taking photos you can then merge the data with your pictures and use it as a Geo-tagging device too which is another very handy feature. With the GTrek II using GPS to capture data it means there are really no restrictions as to where it can be used. As long as you are in line of site with the sky you are good to track anywhere on the globe. The device is initially aimed at those who Ski/snowboard although a new optimised version is out for riders too. Bluetooth connectivity allows the device to be hooked up to a smartphone or PDA and then you can use the tracker as a Sat Nav. More details can be found over on the GTrek site.